​Microcurrent facial & body sculpting has recently gained popularity in US, especially among Hollywood celebrities. The benefits of the procedure include eliminating fine lines, creases, and wrinkles, restoring the glow of youthful skin, visibly firming, contouring and lifting the overall droop; and tightening sagging jowls, double chins, and fatty cheeks. Microcurrent is a physical therapy modality that has been in use for over 16 years. How does the treatment actually work? Microcurrent aids in reducing the signs of aging by utilizing a low level of electricity known as microcurrent. These tiny microcurrent impulses trigger chemical reactions at a cellular level to enhance the production of natural collagen and elastin, provide circulatory benefits and work directly on the nerves and muscle fibers. The result is visible firming and smoothing of the skin. 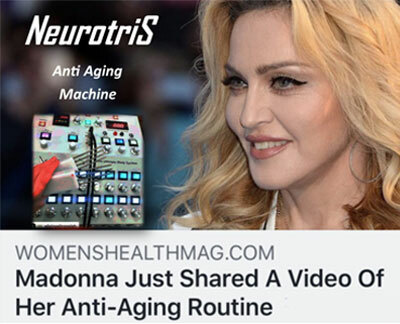 Turn back the aging clock...NEUROTRIS is the ONLY machine in the world that has proven the BEST results. No fillers, No botox, No surgery, No Photoshop only Neurotris and DNA. Absolute True Microcurrent. How quickly will I notice a difference in my face? Some clients notice a difference after the first treatment. Other clients will notice it after 3 or 4 treatments. The important thing to realize is that the effect is cumulative — that is, your face will become more tightened and toned with each treatment. When you get the desired effect, you can begin your maintenance program of having a treatment anywhere from 4 - 12 weeks, depending on your unique body. What are the side effects? Microcurrent changes muscle tissue, softens scar tissue, and increases circulation with the effect of removing long stored waste products and increasing cellular metabolism so quickly that there is often a detoxification reaction after treatment. Some people have a similar reaction after a massage but the reaction after Microcurrent is stronger because so much is accomplished in such a short period of time. The side effects can include nausea, fatigue, drowsiness.